Should learning to meditate be free? Should instructors be paid for sharing their expertise? I’ve been thinking about these questions intensely since attending a recent meditation teacher training in which the answer was a resounding NO. Without naming names, this training was offered for free by a local non-profit that has brought meditation into public schools, churches, the military, large corporations, prisons, hospitals–you name it. Although I already had formal training as a Mindfulness Based Stress Reduction teacher and other forms of meditation, I wanted to learn more about best practices for working in the public sector. But the day left me feeling very frustrated and discouraged. We were told that we were not being certified as representatives of the organization, that they did not want any volunteers, and if we wanted to teach meditation on our own, we should should still follow their provided script and not bring in any other wisdom or techniques. They reiterated again and again that we should not charge for meditation instruction, period. I felt confused. While I feel that meditation should be made accessible to all, those sharing their skills also need to make a living. How to balance those issues? At the lunch break I sat with a few participants and informally polled them about their reasons for attending and intentions to teach meditation. Everyone had noble aspirations, from teaching their grandchildren to meditate, to working with battered women’s shelters, to making meditation available to non-English speakers. Sharing the benefits of a meditation practice with others is a beautiful thing; with that I could not argue. Yet I had invested $2500 in my training as an MBSR teacher, not to mention the money I had spent learning bodywork modalities, yoga teacher training, and personal enrichment, trying to make myself a well-rounded teacher. Was I wrong to want to be compensated for my hard-earned expertise and experience? I decided to press the instructor further on his financial model. If his organization has no outside funding, there are no paid employees, he doesn’t charge for his services, and this is his full time career, how does he support himself? I asked him this pointedly in front of the group and he replied, “How do I live? I live peacefully and happily.” It was all I could do not to flip him the bird. I felt insulted, frankly. I am serious about my meditation practice and about sharing its benefits with others. I am just as serious about paying my rent on time and wanting to secure a future for myself. Money is not a dirty word; it’s just energy. Exchanging money for instruction in meditation seems acceptable to me. I have always donated some of my time and services to underserved populations, which is my way of making them accessible to those who might not be able to afford them. After this experience I began to wonder, should people charge for meditation instruction? I mean, what could be more simple than focusing the attention on the breath? It’s the birthright of everyone on this planet. Everyone has the tools, yet I hear from people all the time that they want help in developing the skills, and some are willing to pay for that expertise. But not all. Twelve years after starting my massage practice, two years after my yoga teacher training, and a year after my MBSR training, I am barely getting by financially. I am in my mid-40s and have never made more than $20k per year. I’m over it! I don’t aspire to be rich and enjoy living simply, but I would like to feel secure, knowing that I can pay my bills and be planning for my old age. Mindfulness was recently on the cover of Time magazine, evidence that it has become mainstream, yet here I am. I’m not sure what I want to do with all this. I am planning to go back to graduate school in the fall and finish my master’s degree in library and information science, hoping it might lead to a better job where I can still help people. I’m not sure what to do with this blog, or my website, whether to market my teaching or where to put my energy. I would really like to hear from people about whether meditation instruction has value, and whether to charge a fee or not. If you are “making it” as a spiritual teacher, let me know how. Is there a model that you think works well (e.g. a corporation sponsoring meditation instruction made available for free to participants)? Teachers, students, I want to hear from everyone. I’ve been aware of this little saying for as long as I can remember, at least back to when you could still buy something for a penny (gumballs were a favorite, or your fortune dispensed from an animatronic gypsy in a glass case at the Boardwalk). These days pennies actually cost more to make than their inherent worth. But I still pick them up. Sometimes I see a penny that’s been really banged up, like some kids probably put it on the railroad tracks, or it got washed with a load of zippers. Some even have a green patina, like they’ve been lurking at the bottom of a junk drawer, mingling with other chemicals. But I pick up the ugly ones, too. 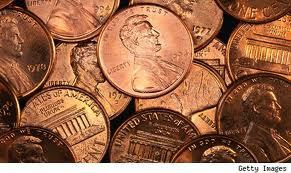 Pennies on the street have become a symbol of abundance to me. Even though on their own they aren’t worth much, they add up. And more importantly, they are representative of the abundant nature of the Universe. God doesn’t care if you find one penny or a hundred dollar bill. Money is energy. And even one cent is a little slice of that energy. Sometimes I collect so many pennies that my wallet bulges and feels heavy. It doesn’t matter to me that it’s filled with pennies that couldn’t even buy an ice cream; I look at it and say, “Wow, my wallet is overflowing with money!” It’s this gratitude that acts as a magnet and draws more abundance into my life. Maybe later that day I’ll find a nickle. The fact that I believe that the penny is prosperity is what helps me fill my wallet with more than enough. Your job is not to say how or when abundance comes to you, but simply to say yes to it. When it occurs, become the observer and give thanks for everything. Every time you see a coin on the street, pick it up and recognize it as abundance flowing your way. Receive the energy. Say thank you and be grateful.